WARNING: No good comes from a book with magic, mayhem, theft, murder, sass talk, demons, animals committing felonies, gleeful revenge, and bad things happening to good people for no particular reason. This story won’t encourage good habits and probably fine tune bad ones. The only lesson is don’t lie until you know the rules. Teenager Peter Whistler lives at the Little Angels Home for Orphan Boys. Life in New Jersey is harsh in the Great Depression, but Peter has an exceptional ability to lie. He hones his talent, convinced it’s the ticket to easy fortune. He certainly doesn’t foresee the arrival of a murderous conjurer with mysterious designs on a little blind girl named Esther. Drawn into a nefarious plot to unleash a demon, Peter leads Esther and an enchanted terrier on a desperate escape to New Orleans and meets Amelie Marchand. Like all well-bred southern girls she’s trained in deadly martial arts, but with a murderous stepmother, Amelie has troubles of her own. Peter and Amelie’s one chance for survival is to head deep into the bayou and seek help from a mad shaman known as the Frog King. Welcome to an alternate 1930s where both jazz and magic fill New Orleans’ air. 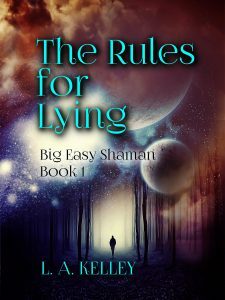 Can a little luck, mystical lies, and a dash of Cajun crazy help Peter harness the power to kill an immortal demon? If not, the Depression will be a picnic by comparison when hell arrives on Earth.